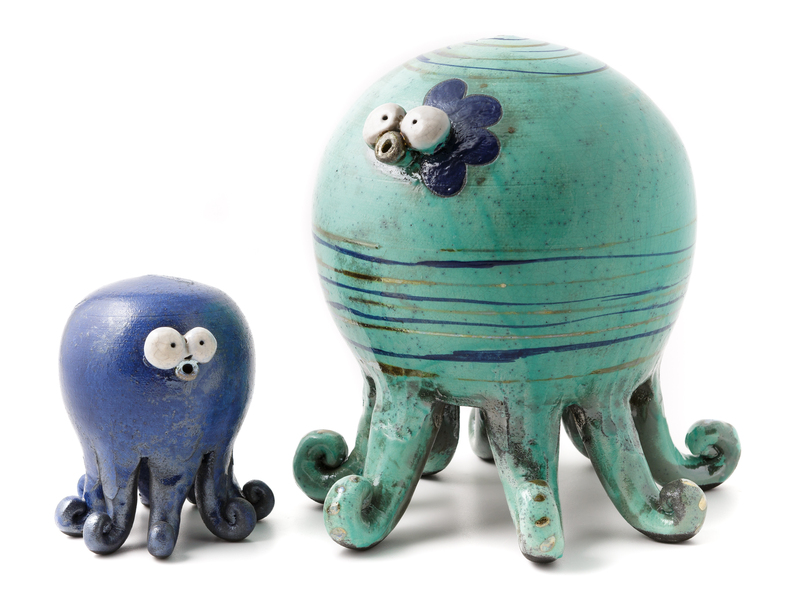 The sculpted figures of the handcrafted raku ceramic octopuses are dynamically stylised so as to enhance their playful and elegant shapes. Available in five sizes, original colours and ever-changing surfaces. 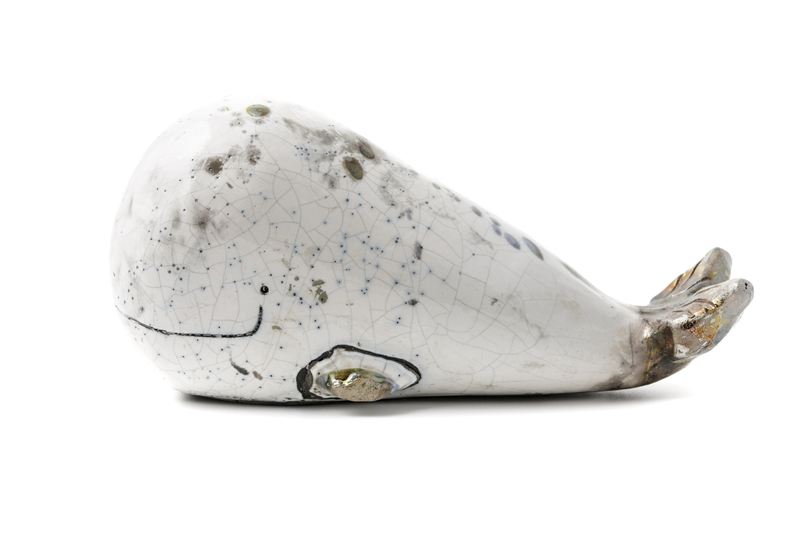 Elegant and playful, the raku ceramic whales are handcrafted in stylised shapes and come in five sizes, with different colours and surfaces. 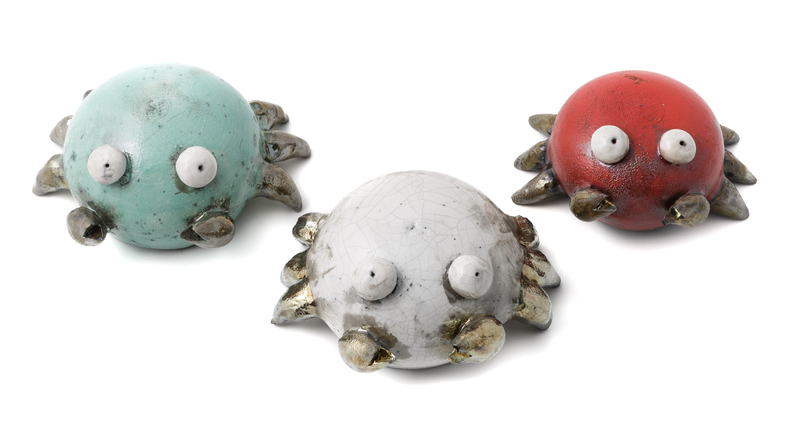 These handcrafted raku ceramic decorative sculptures depict brightly coloured playful crabs. Handcrafted, they come in four sizes with different colours and surfaces. 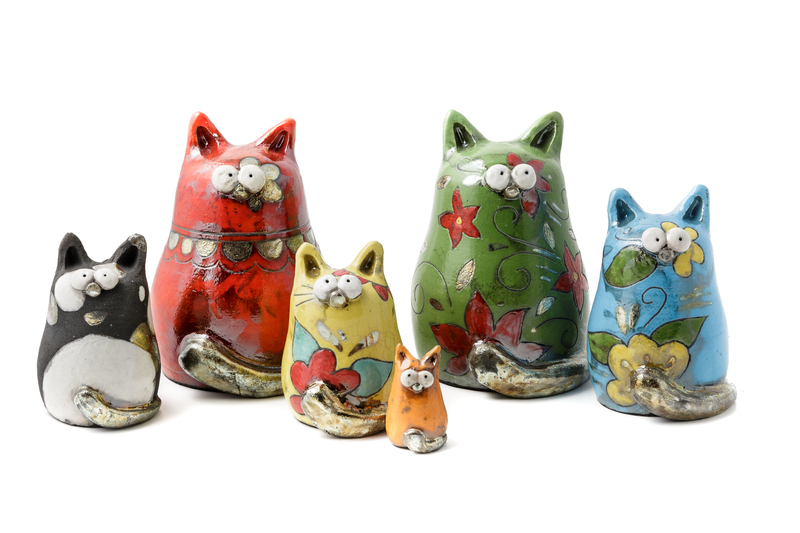 The cat gazes with innate elegance from the raku ceramic sculpture realised in bright refined colour combinations, unique for each individual entirely handcrafted piece. The contrasting effect of black and white is embellished with colourful decorations and a golden glitter in fine stylised sculptures of fish. Realised with the raku technique, they are available in five sizes, with different decorations. Simona Armas and Iacopo Ladu put all their creativity into crafting joyful, elegant decorative artefacts using the fine raku pottery technique. Their range of subjects and images belongs to a fantastic colorful world where big-eyed animals, rendered with vivid colour combinations, express light-heartedness and imagination according to their distinctive personal taste. After studying at the School of Art in Oristano, Simona continued her training as an apprentice for master ceramists in different parts of the island. 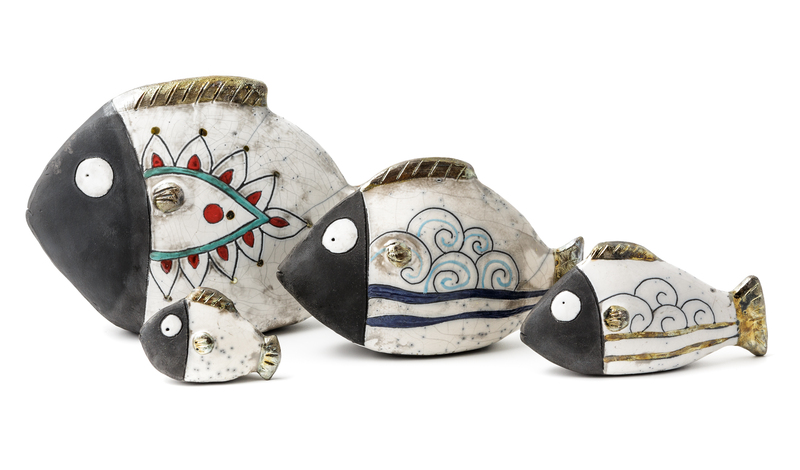 In 2008, she set up her artistic ceramics workshop in Iglesias, a town in the south-west of Sardinia, which she called Artijanas, where she started crafting her unique objects using the raku technique and playfully interpreting themes and colours inspired by the island, as can be seen especially in her collection of expressively stylised animals. Iacopo Ladu joined Artijanas in 2014. His artistic flair and craftsman’s skills emerged during the training period in Simona’s workshop, thus triggering a successful collaboration characterised by creative growth and an increase in productivity. They currently work in their spacious workshop in Iglesias, promoting their wide range of creations mainly at the Homi trade fair in Milan, the major event in the sector reserved for international operators. The rich production of Artijanas features a joyful aesthetic taste animated by animal figures stylised in a very personal way, with vibrant combinations of bright colours and black, thus achieving an original aesthetic result using the fine raku technique. Artijanas crafts different lines of home décor, small and large ornamental sculptures, grouped by theme in the Bestiario (bestiary) line of land animals: the stylised figures of cats, sheep, pigs, hedgehogs, hens, tortoises and many more, alongside the seaworld line where fish of various shapes and sizes, octopuses, crabs and whales express a lively marine life. All the Artijanas productions are crafted using the raku technique. Lathe-shaping and plate-shaping are done according to each project, with subsequent manual plastic additions.